The very first things that should be covered before you start any cardiovascular or resistance training program is to complete a PAR-Q. This form is a guide which assesses your current fitness level to determine whether or not you are physically ready to begin a workout program. If you answer 'yes' to any of these questions you are advised to visit your medical doctor for any tests. Complete a lifestyle questionnaire will help you determine what level of program is appropriate for you. Fill out a self-contract form to help you track your progress and hold yourself accountable for your actions. Either use the example programs provided or make your own by implicating the goals that you have provided. Finally, keep track of your progress in a log book or an app (iPhone). Having a good time and enjoyment are the key variables to a successful transformation. 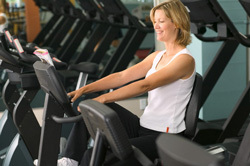 Try to search for a Personal Trainer that can keep you interested in maintaining your workout plan. Social support is required for maintenance and if current friendships are not the active kind you may wish to join clubs or groups where you can find them. An excellent way to meet active people is joining co-ed sports teams. How many days per week are you going to design your routine for? To improve your body composition you should be designing your routine for at least 3-5 days per week. Any less and you will be maintaining your current physique. The type of workout is next. This could either be a weight loss, muscle mass or sports specific type of routine. Once you have your goals in mind you can decide. The amount of rest is determined by the goal of the workout. If you are training for muscle mass the optimum amount of rest is one minute and thirty seconds. While the ideal amount of rest for losing body fat can be zero to one minute and thirty seconds. Beginner workouts usually consist of 3 days with a whole body workout on each day followed by a rest day. 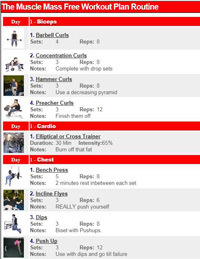 Beginner workouts are designed to get your muscles prepared for more intensity and neuromuscular adaptation. Intermediate workouts might still contain a 3 day whole body workout but the big difference is that the intensity of each workout is increased. You may have some advanced training principles like drop sets, circuit sets, or pyramids. A lot of athletes that have not been in a gym before may be able to begin working out at this level instead of starting at beginner programs because their muscles may be ready for the intensity. Advanced workouts are not for anyone who is not dedicated to 5-6 days of week and improving their nutritional habits. These plans will receive the best results in the quickest amount of time. Advanced routines consist of a majority of advanced training principles to fatigue muscle tissue. The goal of most of these plans will increase your VO2 max and prepare your body for a more intense workout.